this reacher is great. The black Velcro was off in the packaging so I am going to call to see how to attach it. but the reacher works great!!! I use this reacher for everything and everywhere! Durable and has the best gripping power! I Have One In Every Room Of The Apt.! I just broke my last old-fashioned, made-of-wood grabber and I couldn't be happier because now I can replace it with an ArcMate! They are by far, the best on the market! The Best Reacher/Grabber I have ever used! I have a severe latex allergy and I am so thankful that this item has silicone tips and very comfortable mechanisms. It is easy to grip and hold an item. Large and smaller items are easily reached and grabbed! I'm also very please to support an item that is "Made in the USA". I love the way this particular reacher/grabber really grips an item. I take jars down from the cabinet and this makes me feel safer about doing so, without fear of slippage. In comparison to the ON-TEL tool, this is a Cadillac versus a trike! The EZ Reacher Deluxe is a product that helps me live a more productive life, without worry of falling off a step stool or waiting until someone else is home for me to reach an item. I live with MS, and that can present quite a challenge for me in my life. However, reaching and grabbing an item is not going to be a problem from now on! Thank you so much for a wonderful product. The guarantee is also fabulous! The need for an additional EZ REACHER brought me here. Take it from me,the copycat brands do NOT work. Since my physical mobility has worsened, I now need more than one EZ REACHER. Therefore, after the quick breakage of a copycat brand which I only acquired due to needing more than one, I'm here to order another EZ REACHER. This purchase will give me the convenience of having 2 at my disposal since it is the original one on the market and the BEST! I'm still using the one that I bought in 1995 and after 17 years, it is still working as fine as day one. So, trust me, you'll literally be in better hands with this brand. I have a deluxe model i bought in 1995 apx. and although the locking mechanism is long since worn out the rest of it is still going strong, I use it everyday and would be lost without it. I love it so much I am purchasing another one. These are the best ones I have ever seen. This product is great. Tested several other grabbers and this Deluxe reacher is by far the best. Also customer service was very helpful. I would recommend this for everyone. Over 30 years of using reachers I have to say these are the sturdiest and most functional reachers around. And if you do a lot of searching around you will also find them reasonably priced. The accessory addons for them work well and enhance an already good product into the best around. 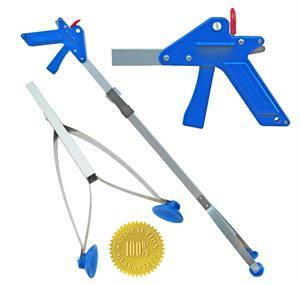 Superb and economical tool for picking up empty cartridge cases and shotshells from the ground.